Excerpt from the 2016 Biosphere Expedition Tien Shan report. Coenonympha sunbecca is shown with recorded observations and natural history. This is where Lapis Guides all began. The initial goal was to just create an interactive field guide for the butterflies of Ala Archa National Park. 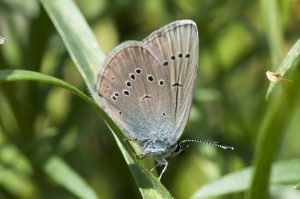 However, we quickly realised that simple interaction wasn't enough, and that there would be more benefit to science if it was possible for users to send in images of butterflies that they have captured in the field and identified with the guide. One thing led to another, and all of a sudden we had a full fledged citizen science app for the butterflies of the entire country of Kyrgyzstan. Over the years we have continued to build further on the Lapis Guides platform. And it is all thanks to the beauty of the butterfly. 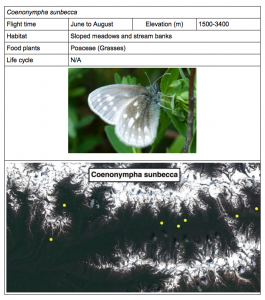 One of the research aims that we are currently working on is to use data, submitted by citizen scientists, of three alpine butterfly species; Parnassius tianschanicus, P. delphius, & P. mnemosyne. We are focused specifically on data that has been collected in the East and West Karakol River Valleys, which runs between the Kyrgyz Ala Too and Jungal Too mountain ranges to the south of Bishkek (Click here to read a report from the 2016 expedition during which data was collected) . The data will allow a GIS model that compares butterfly distributions with NDVI vegetation indexes to be produced. Using NDVI models, we can judge the rate of vegetation change in elevation and see if there is a significant correlation with the advancement of climate change. We expect that with longer and warmer summers, an increase of vegetation at higher elevations would result. By monitoring the mean elevation of these butterfly populations, we can determine if there is a correlation between the mean elevation and climate change advancement. Since butterflies are dependent on specific host plants, we would expect that as vegetation begins growing at higher elevations, that butterfly population densities at these higher elevations should also rise. Eventually, we see this as a way to monitor climate change through butterfly populations. This project is also being used by local university courses to teach students how to collect data using modern tools, import that data into a computer program, and run statistical analyses on it.